A selection of Rainmeter skins based on the look of the bombs from the bar scene in Tron Legacy. 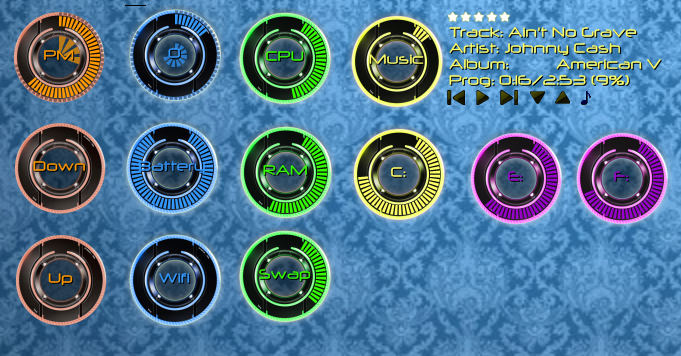 Now with 5 colour variations - middle mouse button to toggle. *5 colour variations added - middle mouse button to toggle. *Lua Marequee Scrolling added to media player - Cheers Smurfier. * Tool tips with additional information added to most meters. *Added Clock and Uptime meter. * Minor changes and tidying of code. OW - w0w !! - "your really on the ball - your work keeps getting better and better - many thank's for high quality work, great creativity, and great design." ps: "i have one word for you - "IMPRESSIVE"." It also requires work from other people, Smurfier with the maths, Poiru with the now playing plugin and plenty of others who help with my questions when I am struggling with stuff It would not be possible without the community at the Rainmeter forums. OW - "then, i say Kudo's to you and your other colleagues - either way - brilliant !!" ps: "compliments to "Smurfier & Poiru"."